My favorite of the previous sequence, and I somehow inadvertently left it out. So here's one more. It's nice to see the searching and erasing in these roughs. When you've only seen cleanups and re-worked sketches, you come to assume that every line that came from the man's pencil was gold. In some way it's comforting to me to know that it wasn't all purely natural ability that made Fred Moore's work so great. The fact that these sketches demonstrate that he had to work through his ideas, and fight the paper a bit gives me, not naturally gifted, a measure of hope. Thanks for all the posting you do, of Fred Moore's work and your own. This is a very inspiring site. Thanks, also, for including me in your sidebar link list. It's both gratifying and humbling to see my name on your page, among those that I admire. I can't begin to tell you how happy I am that The Disney Blog provided a link to your excellent blog. Freddie Moore to me is the personification of all that is wonderful about Disney animation. I had the privilege of corresponding and meeting with Ollie Johnston, and he always felt much indebted to Fred. Anyway, keep up the great posts! 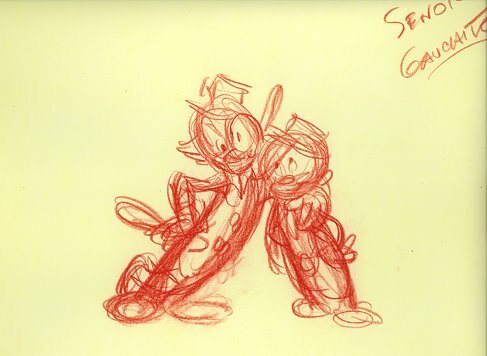 i always get sad and discouraged when i see other animators "ruffs" like marc davis, or some other super-clean draftsman, but its comforting to see these real ROUGH drawings, since some of my stuff is super rough(but not as good hhaha) thanks for posting these! !